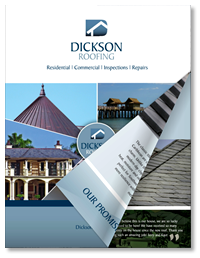 Dickson Roofing has served Southwest Florida for over three decades. Our comprehensive experience covers every conceivable roofing project, from repairs to replacements to new construction. Whether it’s a home or business, pitched, flat or gabled, tile, slate, metal or wood, Dickson’s craftsmanship is the finest available. The resilience and beauty of the projects we’ve completed are evidence of the quality of our work and dedication to the customer. We take great pride in offering you a family of highly qualified, fully trained professionals who our customers have trusted since 1976. Come to us with your vision and your objectives. We look forward to seeing you under our roof!